As the giant electronics trade show kicks off in Las Vegas, Amazon's voice-activated digital assistant has already added personal computers and smart mirrors to its domain. And in a sign of the growing importance of voice-activated software, Google is hoping to make a splash at CES with its rival software. Amazon’s Alexa is extending its domain to a whole new set of gadgets. Smoke alarm? Check. A $1,300 smart mirror? Check. Personal computers? Check. In what’s becoming an annual tradition, the CES electronics trade show, being held this week in Las Vegas, has brought a flurry of announcements of new gadgets built to work with the Seattle company’s voice-activated Alexa software. Also new this year: Some serious competition. Google is trying to make a splash at the world’s largest electronics trade show, blanketing Las Vegas with advertisements and its share of new gizmos that can be controlled by its Google Assistant. For the first time in several years, Google has planted the flag at CES with a large booth of its own, which GBH Insights research chief Daniel Ives attributes to the growing importance of software that can be used to manage other internet-connected devices. Ives expects “a big push” from the California search giant at the trade show, he said in a research note. Intelligent speakers, like Amazon’s Echo and Google’s Home, are “quickly becoming the core foundation of smart homes,” he said. Analysts say some consumers find it more natural to manipulate smart devices like door locks, lightbulbs and televisions with their voice instead of smartphone apps or dedicated remotes. The competition to build software people can manage with their voice is one of the hottest topics in consumer technology, drawing, in addition to Amazon and Google, the attention of giants like Apple, Microsoft and Samsung. Some of those companies have strengths Amazon can’t match. Google’s Assistant can be summoned on Android smartphones, and Siri lives on Apple’s iPhones. Microsoft’s Cortana digital assistant is installed by default on Windows 10 computers. But Amazon is leading the race to make software that can control other machines. The company largely invented the modern smart-speaker category with the summer 2015 launch of the cylindrical Echo speaker. At the same time, Amazon offered a set of tools designed to help other companies build Alexa into their own devices. Amazon stole the show at last year’s CES, with manufacturers announcing a wide range of new integrations between their products and Alexa. Since then, the company has launched a refreshed line of Amazon Echo speakers, including a model designed to make it easy for consumers to get started using Alexa to manage their lightbulbs, refrigerators and televisions. The company doesn’t disclose sales of Echo devices beyond a year-end news release touting the sales of “tens of millions” of Alexa-enabled devices during the holiday season. Analysts with RBC Capital Markets estimated that Amazon sold 33 million Echo devices in 2017, up from 4 million the prior year. During the media days before the kickoff of CES this week — the show floor doesn’t open until Tuesday — newly announced Alexa-enabled devices ranged from classic electronics (a Hisense television, a Garmin GPS device), to cutting edge (a $1,000 pair of smart glasses). Other devices seemed to extend the definition of smart home to new corners. 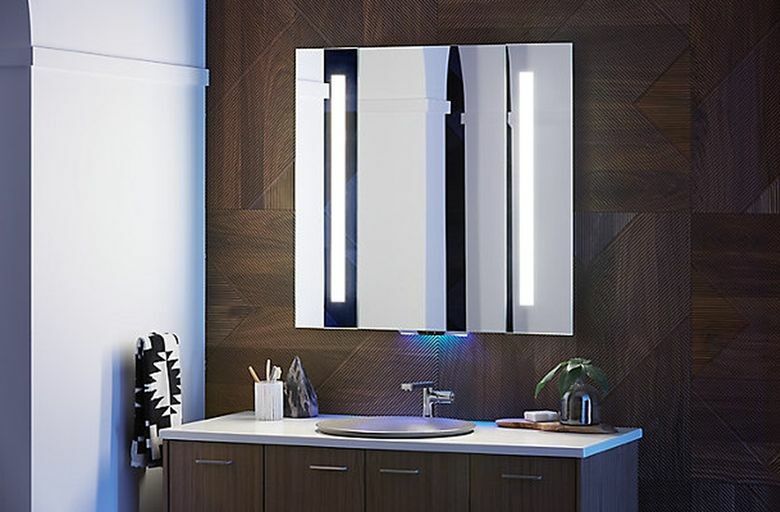 A Kohler-branded mirror, the Verdera Voice Lighted Mirror, has embedded microphones and speakers, bringing Alexa to the space above the bathroom sink. Customers can also use voice commands to turn the mirror’s embedded lights on and off, and tap into the rest of Alexa’s skills, like asking for a weather report. The 24-inch model starts at $1,332. Alexa is also making its way deeper into the realm of Microsoft’s Cortana. Lenovo, HP and other major personal computer makers announced this week that some new computer models would include the ability to converse with Alexa.